GeoConnected: Practicing What We Preach: Geo-Connections Installs New Loop Field. Practicing What We Preach: Geo-Connections Installs New Loop Field. Geo-Connections broke ground on the bore holes for our new facility late last week. 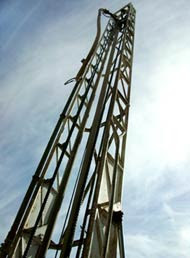 The system was designed with LoopLink (of course) and consists of twelve, 200' vertical loops on fifteen foot centers. The building it will supply is 120'x60' with 20' side walls. We thought we would share photos as the project progresses. Drilling is going a little slower than planned but the soil contained a lot more gravel than expected from our previous bore fields and we did hit a rock shelf just past 100 feet. The drillers switched out their bit and we are expecting things to move quite a bit faster through out the next couple of days.